The Oenophilia Wine Tasting Kit in Cork will be the show stopper at your next wine party with its fun, vibrant pieces. Featuring six colored and numbered bags, this kit will keep everyone in the dark as to what each wine is until the big reveal making this perfect for the ultimate wine tasting event. 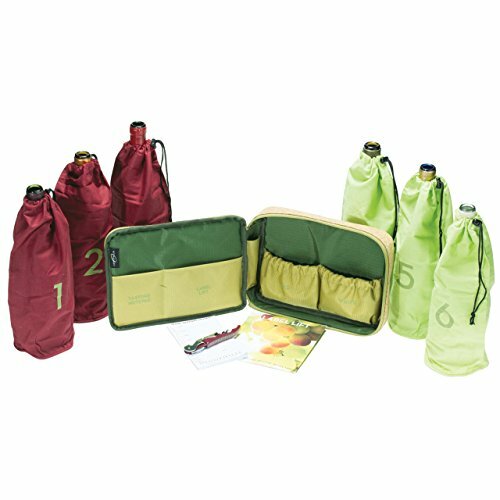 This wine tasting kit has everything you need to host you next tasting event, all in a convenient cork carrying case. This set includes six numbered cloth bags, a 40-sheet wine tasting notepad, ten label lift sheets for removing wine labels, and one 02H corkscrew. This cork measures 10” L x 7.5” W x 2.5” H.
If you have any questions about this product by Oenophilia, contact us by completing and submitting the form below. If you are looking for a specif part number, please include it with your message.